Auxiliary Bishop Evarist Pinto of Karachi said after his consecration April 25 that increased knowledge of biblical teachings will strengthen the Christian community in Pakistan. Speaking in English, then shifting to Urdu, Konkani and Punjabi, Bishop Pinto expressed his belief in spreading the Good News by forming Bible study groups among grassroots communities. The new bishop´s coat of arms bears the motto: "Preach the Good News to the Poor." 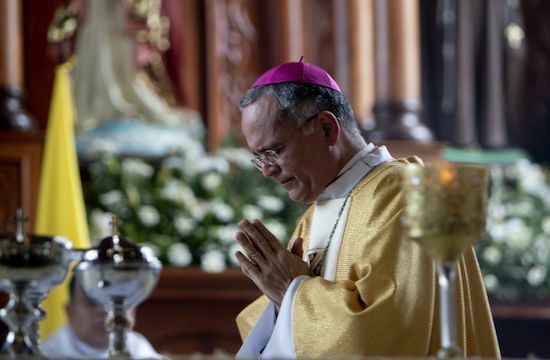 Archbishop Simeon Pereira of Karachi consecrated his new auxiliary a bishop at St. Patrick´s Cathedral in a ceremony attended by all the country´s Catholic bishops and Apostolic Nuncio Archbishop Alessandro D´Errico. Born in 1933, Bishop Pinto was ordained a priest in 1968. He did graduate studies in Sacred Scripture at the Biblicum and doctoral studies in Biblical Theology at the Pontifical Urban University, both in Rome. The new bishop has much experience in pastoral work in various parishes in Karachi and is respected as a teacher of biblical theology. He was a professor of Sacred Scripture and dean of studies at the national Christ the King Seminary from 1981-1990. Bishop Pinto has authored many books on the Scriptures and writes a reflection on biblical themes regularly in the Karachi archdiocesan publication "Christian Voice."